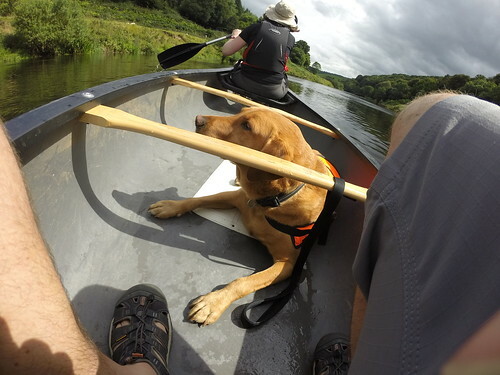 As you can probably tell from the photo above, it turns out that Labradors are skilled canoeists. Molly is fine with water and has been on various boats before, so I put her non-slip bath mat on the floor of the canoe (so she had somewhere obvious to sit) and coaxed her in with a couple of biscuits. She then promptly jumped out, then jumped back in again and demanded another biscuit. It was at this stage that I realised I was being played. 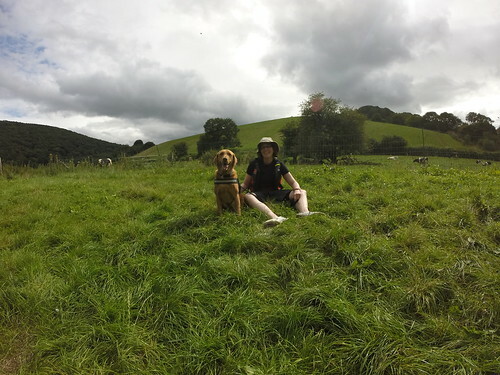 So I told Molly to sit, gave her one last biscuit and pushed us away from the bank. And so we were off… As you can see, Molly quickly got the hang of things and made herself comfortable in the sunshine. We paddled downstream for a couple of hours, with lots to see and no major dramas. Molly just sat there in an incredibly chilled state, watching the world go by and periodically shoving her head into the water to see what was going on there, too. All too soon, though, we were at the designated exit point, where we were to meet a minibus that would take us back up to our car in Monmouth. As you can see, both Molly and Natalie were clearly enjoying themselves. A few weeks later, we decided to take things to the next level. 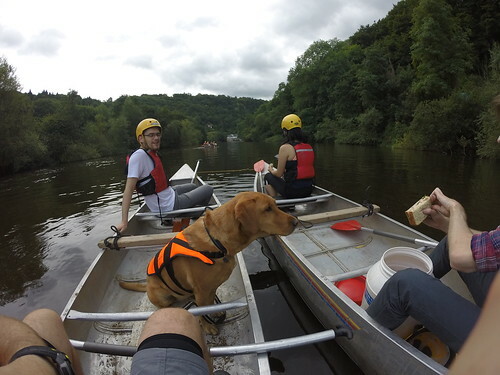 Together with some of Natalie’s colleagues, we headed back to the Wye, this time to take a slightly longer trip that included the Grade 2 rapids at Symonds Yat. Because the water levels were quite high, the canoe hire company lashed a couple our our canoes together. Natalie and I were the most experienced canoeists (this being, in case you’ve lost count, my third time in a canoe! 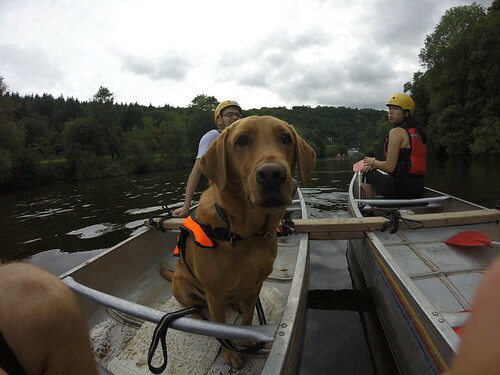 ), so Molly and I went in the rafted-up canoes with three of Natalie’s colleagues and Natalie went with another of her colleagues in a single canoe. Molly leapt into the canoe like an old hand and quickly made herself comfortable by my feet. The rafted-up canoes were ultra stable and she really seemed to like having so many people to talk to. We came to the rapids after about three quarters of an hour of paddling. They’re not exactly white water, but they’re fairly fast and lumpy, so I was interested to see what Molly thought of it all. And she absolutely loved it. She seemed fascinated by the breaking waves and wasn’t at all fazed when a couple of them broke over the bow of the canoe. Definitely a water-dog. Once again, the trip was over all too quickly. But we all had an absolutely great time. And now I know that Molly seems to like canoeing as much as I do (or, at least, endures it without attempting to escape), I’m sure that we’ll be doing a lot more of it in the future. Like the mythical sirens of yore, the song of the paddle has worked its magic once again. 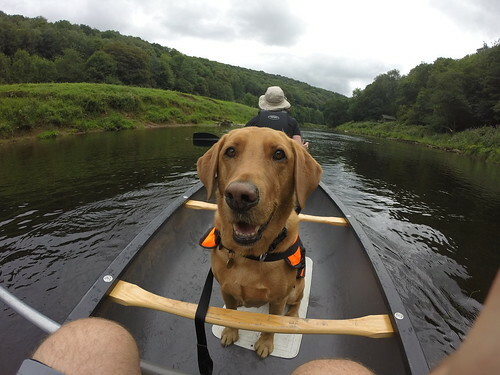 This entry was posted in Canoeing, Dogs, Outdoors, Watersports and tagged Canoeing, Dogs, Labrador, Molly, Outdoors, River Wye, Watersports by Simon Perks. Bookmark the permalink.